"Modified Penny Arcade Adventures is an adventure game which mixes 3D gameplay with 2D interstitials and cinematics. The gameplay consists mostly of seek-and-find puzzles, reminiscent of adventure games, where the player must collect items and return them to a character to advance the plot. They can also collect spare robot parts to upgrade their weapons. Battles consist of a real time combat system similar to the ATB system of Final Fantasy Games, with context sensitive button presses reducing damage or being used to carry out special attacks. The game begins with the narrator reading the first verse of a poem, later called The Quartet for the Dusk of Man. The player then designs a character of their choosing; with an introduction in the 1920s suburban neighborhood of the Player. A mysterious voice instructs the Player, whose home is quickly destroyed by a giant steampunk robot, while smaller ones attack. After a brief tutorial, the player teams up with Tycho Brahe, a scholar of Apocalyptic Studies turned detective, and his exceedingly violent partner who fought with the devil, Johnathan Gabriel, in search of information on the robots." 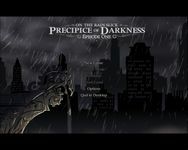 Source: Wikipedia, "Penny_Arcade_Adventures:_On_the_Rain-Slick_Precipice_of_Darkness," available under the CC-BY-SA License.